This cheese is known for its easy, mellow flavor. It's very slightly salty and, because of its understated flavor, is extremely versatile. 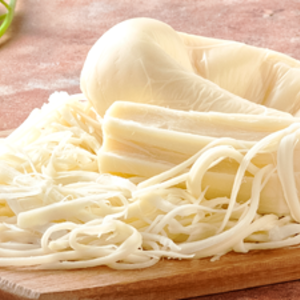 Oaxaca cheese is delicious in savory dishes, baked goodies, or pulled off the batch raw like any good string cheese. It's most commonly sold in ropes or braids, though it can also be purchased as a solid brick. Oaxaca cheese is most often compared to mozarella for its texture and taste, but this cheese can really stand on its own. We like it best in our Vidalia Onion Quesidilla with Fresh Guacamole. The cheese's mildness lets the sweetness of the onions shine while providing a creamy, melty base that ties the whole dish together. Like other unaged cheeses, oaxaca's quality changes drastically based on how quickly its purchased and used. Oaxaca cheese should be as fresh as possible, making it the perfect ingredient to order through PeachDish!